It is so good to be back and into my art and blogging again, but I must say Ken and I have had the most wonderful holiday in Egypt. What a stunning country, steeped in so much history and a mix of different cultures that make it fascinating to see. We have cruised part of the Nile and seen so many sights, the Valley of the Kings with Tutankhamun's grave, many temples at Luxor, Edfu, Kom Ombo and Aswan, plus a flight to Abel Simbel and another flight to Cairo where we visited the Pyramids, the Sphinx, the Citadel and Muhaamed Ali's Mosque, Cairo Museum and a bazaar. Every day was packed with tours and we had great guides who explained the history of the country and the places we saw. Yes we had to haggle prices when we were out, yes we were plagued with people trying to sell us their wares, but it is part of the way of life there. 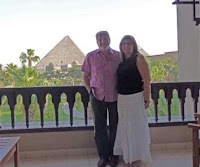 All in all I would recommend this as a place to visit and particularly the Mena House Oberoi Hotel in Cairo which is probably the best hotel in Egypt and has pyramid view rooms. (See the view from ours above). Just an amazing experience. We loved it. However back to the real world. I am very excited to be Guest Designer very soon for 'One Stitch At A Time' and I am in the middle of a project which should be included for the 16th May, so keep your eyes peeled for that one. I won with my 'Trip to Paris' piece and am so pleased to be included - just to say that it's different again to what I have been doing. Well last night, having done some prep for my project I wanted to do 'something completely different' to get my hand back in, and found that the challenge at 'Something Completely Different' is to make a Twinchie with the theme of butterflies. Very soon it will be their first birthday so it's worth taking a look to see what is going on. Happy Birthday girls. I've never made a Twinchie before but of course butterflies always grab my attention. Thinking about what base I would use for it, I remembered I had some Stampbord which I haven't used for ages and luckily there was a 2 inch piece in the bag. 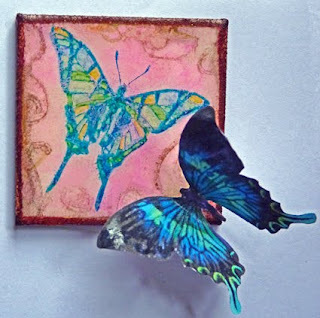 I have used alcohol inks and blender for the background and stamped a Martha Stewart butterfly using Adirondak Stream and coloured in the wings with Promarkers. I stamped some gold swirls round the edges and then heat embossed it twice to give it a sheen and protect the image. I then used the TH distressed powders to do the edges. It seems to be a trademark for me to use printed butterflies so I added one to the corner to add some dimension. Not a brilliant piece of art but it was good to experiment again. Thanks for looking. I shall now go and see what some of my friends have been doing while I have been away. Sounds like you have had an amazing holiday lucky you & lots to scrapbook! Made my first twinchie about a year ago when SCD started its a lovely reminder to go back to them and yours is gorgeous, never really know what to do with stampboard well now I have an idea thank you. Good luck in all the draws. Congratulations on your win and guest DT spot,well deserved.Your butterfly is awesome. You must have some patience I could not work with a piece this small and produce such a stunning result.Your holiday sounds amazing, I thought you might be away as I have missed posts appearing on my blog, no doubt we still have more to see now you are back. Great ideas and inspiration, just what I need. Lovely pictures of your projects.